Is social media really that important? If you’re a business you might think so. We’ll cover some social media engagement strategy advice as well as the importance of social media. Here’s what we’re going to cover. As we have mentioned, social media can help you increase your content’s visibility. This is because you are essentially providing a second residence for your content. And making it incredibly shareable. Social media as a paid channel – social media ads have become really popular. 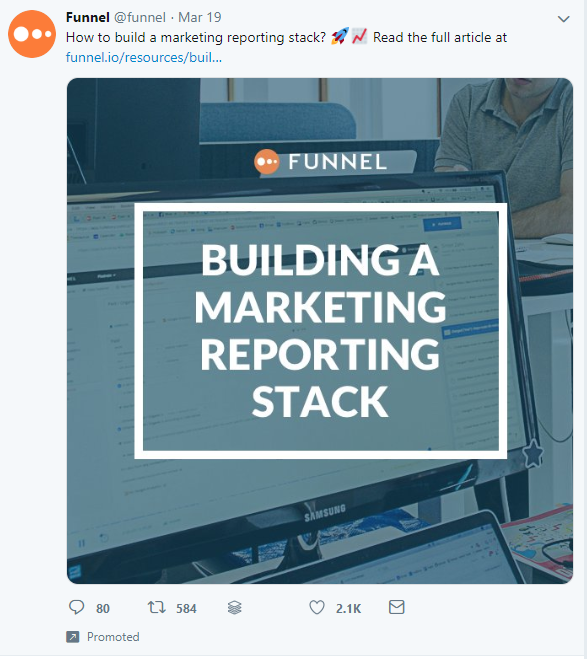 The ads themselves tend to blend in with the content around them and look like the rest of the feed around them (until you see the tiny ‘promoted’ stamped on it). With paid social media ads and boosted content you have a lot of leverage to choose what you want to spend and how long you want it to run. Influencer marketing can be considered as well. By now you realize how vital of a role a social profile will have for your business. But, if you’re still not convinced, here’s a few social media statistics that prove it. 1. When a brand pays attention to its consumers it really pays off. In fact, statistics presented by Lyfe Marketing suggests, 71% of consumers who have had a positive experience with a brand on social media are likely to recommend the brand to their friends and family. This means that social media also plays a huge role in your customer service and the likelihood of getting referral leads. Want to know more about how social media and referral marketing work together? 2. If you’re on social media, you’re bound to find a ton of your customers are too. There are now 3.196 billion people using social media, up 13% from last year. Maybe you have some customers who aren’t internet savvy, but you have a pretty good chance of finding a good handful are. 3. Instagram can get you in front of a ton of new eyes. Another Hootsuite study saw that 11 people joined social media every day. For Instagram, in particular, they found the total number of global Instagram users increased by a third over the past year. More an more users join social media sites every day. Meaning you have a ton of potential opportunities to be seen. 4. Nearly half of all businesses use social media for their digital marketing strategies. Infusionsoft (now Keap) found when asked which strategies they currently use for digital marketing, 49 percent responded with social media management. At the rate of which social media continues to grow, it might be worth imagining this number to increase as well. 5. Engaging with customers of social media builds loyalty. So much in fact, that Social Media Today found that customers spend more money (20-40 percent) on brands who engage directly with them on social media. Do a little bit of engaging and see how it affects your customers. You’ll like find they are happy you are listening to them. This tiny act can turn a person into a true ambassador! Now that you see social media is well worth it. How do you increase your engagement? As you’ll see there are a variety of ways to do it, and most of which are free. Though you’ll find that a paid route may be beneficial in some scenarios, like advertising a new e-course or even promoting a specific new post or guide. Social may be a channel for communication, but it relies a lot on visuals. Most people will scroll through their newsfeeds and pause briefly to check out something that looks appealing. You can achieve this with a good social media template! So by including an image in your post, you are increasing your chances of providing some interesting visual stimulation. Plus, it can help you provide insight into what you’re talking about. You’ve heard ‘an image is worth 1000 words’, and in this case it is true. Research has found that images can result in up to an 85% interaction rate on Facebook and increased retweets by 35%. Most people enjoy the interaction of a quick q&a. Really you can ask for their opinion on anything. Whether it be something that affects them or something that is more internal. For example, you can get the customer to get to know you by asking their opinion on an in-office tie-breaker. This makes them feel like they’re on the inside and have contributed to your business. “Our team can’t decide on a Holiday Party theme, we need your help! Do you think ‘A western Holiday’ or ‘Winter Wonderland’ would be more fun?” Then of course mention, you will provide photos of the even. Even though the survey isn’t about your product or your customers, it’s fun and it’s something that people will participate. Additionally, you can engage with customers on other social sites like Reddit and Quora, and share those posts on your other social profiles. Here are a few ways to build engagement via questions. The example used above would fit into this category nicely. You can create a poll about anything. Whether it be a product question, a fun question, or a serious debate. Polls are great because they are interactive, but they aren’t too much work. You get answers and results quickly, and it takes hardly any effort for a customer to choose. Twitter polls have been pretty popular, and you may have engaged with one yourself. If you look at a lot of today’s top brands, they use Twitter polls as a fast way to engage with customers whether it be purely for fun or insight. You may have seen your fair share of surveys floating around the web. You’re probably also familiar with the ones that pop up every once in a while on your Facebook feed. You know the ones like, “Answer these questions and we’ll guess how old you are”, sort of thing. Well, these pop up because usually, your friends will engage with these types of surveys. They will post their answer, and others decide to join in on the fun. As a brand, you can use this same idea. Even though most of these types of surveys are just for fun, you can use the concept to better engage with your customers. 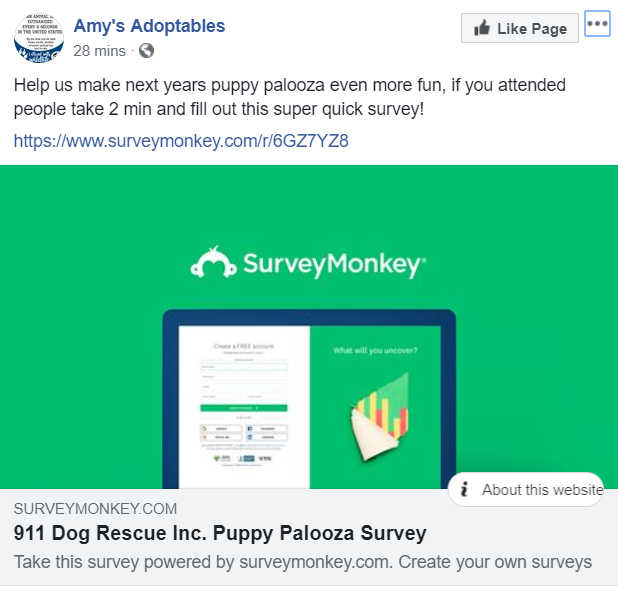 Even if you are trying to ask serious questions to gain real data, you can make it fun or intrigue people to answer by giving them a coupon code for completing the survey. Everyone loves a little bit of humor. And when you get people’s emotions going, you can facilitate engagement. This is partly why memes spread like wildfire. This is also the reason why brands like Wendy’s has done well on social media. They have found a way to make their responses and updates sarcastic and funny. You don’t just have to be sarcastic to be fun or funny though. You can offer something fun or ask for people to participate in something fun. Many brands have been asking their customers to “caption this”, or respond with an emoji. These are effortless tactics to get people to participate. This can further increase your engagement and loyalty. Check out your local businesses Facebook or Twitter. You may find that some of them offer freebies for your participation. 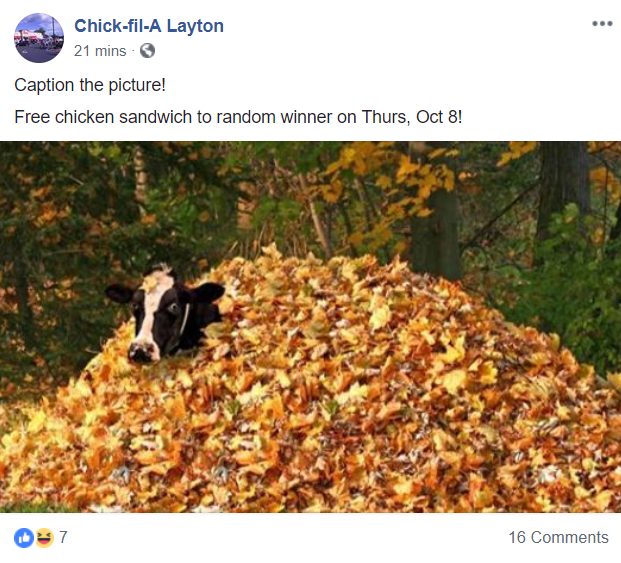 For example, this Chick-fil-A asked it’s customers to caption their image. As you can see they added a bonus, a free chicken sandwich, making the ‘task’ even more fun. Most people try to share things that make them look good, funny, and smart. 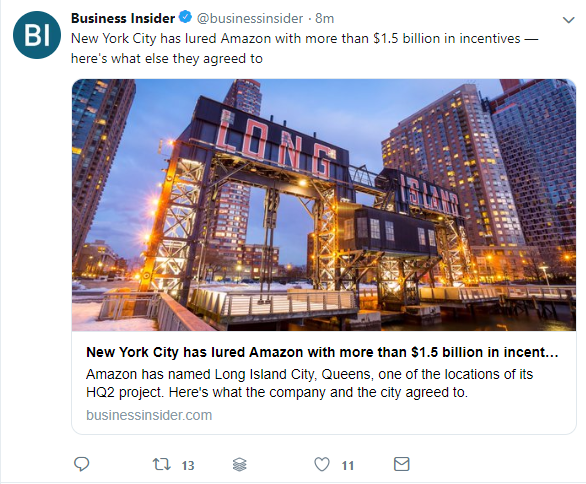 If you share statistics or pull a statistic from your article and use it as the caption of your post, it’ll probably be shared. Statistics are great fuel for sharing. By doing this you’re also paving way for your name or brand to be an authority in your niche. The more in the know you seem, the more believable and trustworthy you’ll seem. All of which are great attributes for sharing. Not only just for sharing either. With an increase in sharing, you’ll likely see a higher engagement rate for your content too. Everyone loves a giveaway. Especially if what you’re offering is something they like. Instagram and Facebook have taken giveaways to a whole new level. One you may have seen a lot of lately are chains of businesses coming together to offer one mega gift or multiple gifts. For example, you may follow a brand on Instagram. That brand may host a giveaway with a couple of other similar brands. They want you to re-post their image, use a specific hashtag, and follow all the other brands in the giveaway. They may team up to give one lucky winner a mega basket of gifts, or they may each draw a different individual to reward with a prize after that person has completed all their steps. Or the more simple version of retweeting or reposting a specific image and using the requested hashtag. Sometimes, these simple ones can bring in extra leads by requesting followers to also tag a friend. Regardless of which route you choose to do your giveaway, you’ll likely see a ton of new engagement. And will likely get a ton of new followers because of it, providing increased exposure for your brand. Tip: You can gain extra followers by including your profile link in your regular email blasts and promoting it on your blog. If you mention the giveaway on top of that, it might intrigue people to follow and like your page! We’ve mentioned quite a lot already on how to increase your engagement on social media. But, really the list can go on and on. Here are a few more of our favorites. Post videos or do live video shares – video content is huge. Videos have a way of intriguing customers to stop and watch. As we have mentioned visuals make an excellent medium for sharing and increase interaction. Talk about your niche, not just your brand – no one wants to land on your profile to read a bunch of salesly mumbo-jumbo. Most of the time, people are simply looking for information in your niche, and if they are interested…they will look into your brand further by visiting your website. If you can provide general information, and establish yourself as a thought-leader, you’ll be easier to engage with. Share content other than your own – Again, it’s not always about you. If you share other content, you may find that others are likely to share your content too. You should realize that a partner business may have the answer to a question that you aren’t as well-versed in. This is also a good way to build backlinks. You’ve put in the effort, and now you can sit back and relax. Well, not quite. You need to monitor your engagement too. If you’re not tracking your efforts, you’ll never know if your hard work, time, and money are paying off. If you truly want to evolve your social media marketing and take advantage of having your face in front of a huge database that you can trim down to your target market, the tracking metrics is a must. As it will allow you the knowledge to tweak as you need, to see what is and isn’t working. There a few metrics you should consider when tracking social media engagement. Here are a few of the most predominant things brand’s measure. Likes – One of the simplest metrics you can see are likes. Practically all social media platforms allow users to ‘like’ or ‘upvote’ a specific post. Youtube, Facebook, Twitter, etc. all have this feature and make immediately evident if what you’re posting works for your followers. Shares – To bump it up a notch from likes, you can measure how many shares a specific post gets. A share usually means someone likes or trusts your post so much that they are willing to share it with their friends. Growth rate – It’s important to pay attention to the rate of followers you’re obtaining. If you see a sudden drop of followers or a slower rate than usual, it might mean you need to do a bit of digging and make a few changes. Whether it be a change in the content you share or even when you share it. Your follower ratio – Sometimes a mixed-matched follow to following rate can deter people from liking you. Even though it’s important to follow other pages and businesses, you need to slow your role if your follow rate far exceeds your number of followers. You may come off as spammy or illegitimate especially if your number of followers is very low, while the number of people you follow is high. Clicks – You may get good engagement through clicks. This is a measurement of the number of times a link you shared was clicked. If you have a good amount of clicks it can be a sign that the content you share aligns well with your audience. Your social pages will have built-in analytics and insights. Usually, these metrics include page views, page likes, and reach, along with a few other summaries. But, if you want to get even more in-depth metrics, there are many social media tools that will allow you to take a deep dive into your social media analytics. These types of tools allow you to measure your performance to help you learn how to take your marketing strategy to the next level. Followerwonk – This one is aimed towards Twitter and offers a free version for you to start analyzing your Twitter profile easily. It provides you with an overview of your followers and their actions. You can also see when your followers are likely to be online, to help you plan the perfect posting schedule for maximum engagement. Google Analytics – So this one is huge, and it’s a great analysis tool. Many businesses use it to track website traffic, but if you drill into it far enough you can get social metrics too. For example, you can determine how much traffic to your site comes from your social networks. Klear – Klear offers quite a few free tools (as well as paid versions), all of which focus on helping you find your influencers on your social sites. Klear ignores fake and bot followers so that you can focus on your real metrics. You can even view your follower’s interests to help you plan exactly what to share. SocialRank – The tool lets you easily identify, organize and manage your Instagram and Twitter followers. It also allows you to filter and sort your followers to further help you take the appropriate action in increasing your engagement. Calculating your social media click-through rate is vital in knowing how well your brand’s visibility is online especially when talking about ads. Your impressions are simply the number of page views. To figure out if you’re posts and ads are successful, you need to calculate the click-through rate. You can do this by taking the volume of clicks and the number of views or impressions your page has and doing a simple math equation. If you’re unsure of where to find these measurements your social profiles will give you this information (if you’re running ads). You’ll also be able to see this information from the analytic tools listed in the previous section. Depending on the platform you are using, you’ll have to modify your calculations. Here are formulas to determine Facebook and Twitter engagement rates. Facebook – To find the engagement rate of a particular post on Facebook you’ll have to do a little math. No worries, it’s quite simple. You are basically taking the number of engaged users and dividing that number by the total reach of the post. Then multiplying that number by 100 to get a percentage. Twitter – Similar to the formula above, Twitter uses the same idea but slightly different formula. You’ll be using your total likes and comments, dividing that by your number of followers and finally multiplying that by 100. As you can see, when done right, social media marketing can be a wonderful thing for your business. It will help you increase your brand authority, brand trustworthiness, and it will even help you engage with customers. You also see that increasing your customer interactions and engagement with social media isn’t really that difficult to do. But the effort you do put in can have a major pay off. Just be sure to monitor your efforts, so that you can track what is an isn’t working for you.